Summary: Not all battery holders are alike and if proper care isn’t taken in their selection, your next IoT design may be your last. The Internet of Things has sparked a revolution that is seeing electronic systems adding intelligence to applications ranging from smart cities to smart hotel locks and medical devices. Each application has its specific requirements, and designers are being pushed to innovate at each level of the design, from the software, processors, memory and power systems, to the hardware and packaging that contains them. Coin-cell battery holders are one of many elements along the chain where innovation continues to thrive, so designers need to pay close attention to new enabling functionality, such as easy-to-use snap-in designs. At the same time, they need to keep a close eye on the fundamentals of holder design to avoid costly system failures, disappointed customers, and frustrated end users. These fundamentals include ensuring the holder meets basic usage and environmental requirements, that the supply chain is secure from poorly constructed counterfeit replacement parts, and that the end design is compliant with regulations governing battery replacement, especially for medical devices. While the IoT isn’t the only driver of innovation in battery holders, it is certainly a key application of the type of innovation now at designers’ fingertips to handle ever-shrinking form factors. Take a hotel door lock for example. As they get smarter and employ more electronics and communications technologies, one option is to run ac power to each door, through the frame and into the lock to power those electronics. A better option is to instead have a small, coin-cell battery-driven power supply that simply requires a battery replacement every six months or so. Of course, the confined space means small holders, which is the general trend, especially for IoT. Bluetooth, receivers, RFID tags, home automation, toll tags and bank security tokens are part of the IoT tracking, communication and data-gathering phenomenon driving both size and overall system cost downward. A decade ago, electronic systems may have had 10 ICs, they quickly moved to seven, then five and now a single system on chip (SoC) IC can do it all, including Wi-Fi, sound and video. This translates to a move to lower power and ever-smaller batteries at an accelerated rate, with the sweet spot moving from 1000 mAhr 10 years ago (THOMAS TO CONFIRM) to between 100 and 250 mAhr today. This has allowed for some innovation on the battery holder itself. While the basic materials still comprise high-quality thermally stable plastics to avoid cracking and gold-overlaid nickel or nickel-plated steel, the holders themselves have become extremely thin. The original BH-800, developed 30 years ago, used a heavy metal contact to keep the battery in place. 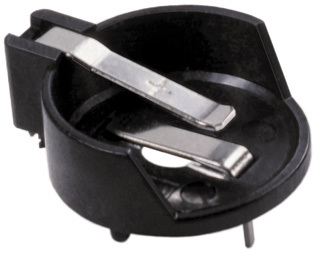 Battery holders such as the original BH-800 used robust metal contacts to hold the battery in place. Smaller, thinner battery designs are changing this. With the new batteries, the plastic captures it and the contacts are made as thin as possible, so the contacts move with the battery like flexible members. The plastic takes care of capturing the battery. Along with making the design simpler to implement, the new design it’s also more robust as the thinner contacts are free to respond more quickly to sudden jars or drops to avoid intermittent breaks in power delivery. They maintain better contact with the battery. A good example is the Snap Dragon holder. The Snap Dragon is a completely different design in that it involves a base piece and a snap-on cover. The battery goes in the cover. The user simply slides off the top, replaces the battery, and slides it back into place again. The plastic cover’s job is to keep the battery still and the contacts are free to move with the battery, so the contacts are very thin and very flexible. That allows them to move rapidly to avoid getting an intermittent break when jarred or bumped, such as when attached to a generator or a machine. The ease of replacement is particularly important for elderly end users, demographic that is increasing and which requires particular attention with regard to holder design. In the US, there are laws governing ease of use for medical devices, stating that the batteries should be easy to take out and replace. Also, if the battery is down in a well where it’s hard to see the shape and the user can’t see the polarity markings, that’s a problem. On the backend, new designs require more finely tuned manufacturing processes to handle the lighter, more delicate materials. From stamping to plating through to inspection, assembly and packaging, there are higher risks that need to be managed to ensure a high-quality finished product. Some products, such as the BH-800 have been mass copied since their debut, and this practice continues for newer products. However, this carries with it some dangers, as it is unlikely the counterfeit part has gone through accelerated environmental testing as well as shock and vibration. If a subcontractor manufacturing a computer server decides to shave a few cents off their costs by inserting a holder that hasn’t been properly certified, the server may hold up fine in an air-conditioned office in New York, but will fail in the desert or other challenging environments, on land or sea. This can cost hundreds of thousands in replacement costs, but even more importantly can cause irreparable damage to a client relationship. Other shortcuts include the use of poor-quality plastics. A good battery holder supplier will have close connections with plastics manufacturers and have access to their proprietary formulations. Other instances where a counterfeit part returned surprising consequences include a glucose meter. Here, the holder didn’t maintain contact with the battery when the device was jarred, so the meter reset unexpectedly and gave inaccurate readings and the users couldn’t understand why they were getting sick. In another instance, the plastic pieces of a baby thermometer came loose and became a choking hazard. Such instances abound, making a secure parts supply chain a critical part of successful design. 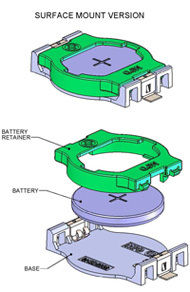 Given time constraints, it’s common for electronic system designers to rely on a third party for their battery holders. However, there are some key things a designer can do to ensure their design doesn’t become a victim of ill-advised cost-saving measures at the beginning and further down the supply chain. For one thing, pick a reliable subcontractor who uses authorized suppliers from the start. Documentation to show its gone through rigorous environmental and vibration testing, and in the case of medical devices, conforms to FDA CFR 21. Ensure that the holder has proper identification markings. “Grey market” devices, sometimes bought from online sources, generally have no markings and so are suspect. Perform a simple visual test. Excessive flashing or contact discoloration are both big red flags. Flashing occurs when excess plastic extrudes through the mold and can prevent a battery from making contact. Discoloration of the contacts hints at corrosion. If it’s gold, it should be bright gold: if it’s nickel, it should be highly polished. Pull on the contacts: if they don’t return to their original position, there’s something wrong. If the contacts are twisted in any way, find another supplier. Taking these basic measures can avoid millions of dollars in repairs where a full system may have to be stripped down and the holder replaced. While it’s tempting to look for legal recourse, if the source of the counterfeit part is China, there’s generally little to be done, so get it right the first time. You don’t want product recalls.